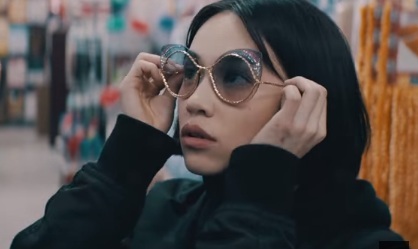 Marc Jacobs has launched the Spring 2017 Eyewear campaign, starring Kiko Mizuhara. features the 26-year-old American-born model and actress walking into a dime store and transforming into several versions of divas and party queens as she tries Marc Jacobs sunglasses. The new collection includes Metal Twist Sunglasses ($200) – aviator, round and oversized – inspired by Marc Jacobs jewelry, featuring a unique metal detail, Oversized Twist Sunglasses ($220), Spotted Havana Sunglasses ($155), Rocket Sunglasses ($220), Flat Metal Sunglasses ($170), Faceted Optyl Sunglasses ($135), Panda Double “J” Sunglasses ($220), Wild Rectangular Sunglasses ($250), Oversized Cat Eye Sunglasses ($250), Aviator Sunglasses ($130), Double Wire Round Sunglasses ($200), Round Bridge Sunglasses ($160), and others. The Japanese It girl is an old friend of the fashion house. Earlier this year, she wore Marc Jacobs Spring 2017 to the “Nova” press conference in Tokyo.